Welcome to our May newsletter. As winter is about to commence it is hard to contemplate that it is now over four weeks since our national conference in Canberra. I was very pleased to see so many members and other people in attendance, and the breadth of delegates was a good indication of how MOD.A has grown to become a national organisation. Shortly after we returned from Canberra we received the very sad news that Ruth Ley, the retired builder from Blue Mountains HMMS, had passed away. We pay tribute to Ruth toward the end of this edition. We are currently busy putting together MOD.A's election platform that we commenced at the conference and which we will be finalising over the coming days. This will be an important election as it will put into power the government that will oversee the final implementation of all the disability and aged care reforms so articles in this edition definitely have an election flavour. As we near the end of the financial year we will begin issuing renewals for those members falling due. Current members should have all received an email link to our Member Feedback Survey - we urge you to complete this survey by 10 June so that we can incorporate your feedback into our next Business Plan and better target your needs. If you have not received a link to the survey please contact the office directly on 02 9281 2680. Those of you who receive the newsletter and who are not members, and think there may be benefits to being more closely involved with MOD.A through membership, can join via our website. It is my privilege, as Chair of MOD.A, to provide in this issue an introduction for our readers to what we hope will be an ongoing series of contributions from each of our Board Members. These contributions will help members learn more about the Directors, their area of speciality/interest in home modifications and their personal vision for our industry, our members and the national and aged care and disability sectors. I'd firstly like to thank all MOD.A staff, members and other stakeholders who attended our first MOD.A national conference in Canberra on 28 and 29 May. All conference contributors and staff in particular worked very hard to make it a resounding success. The level of engagement, debate and enquiry was exceptional and was commented upon by both federal Aged Care and state Disability representatives. The conference helped cement the links to government and other stakeholders that MOD.A has developed in its first year as a national peak body. Both Michael as CEO and Board members, through this newsletter section, will continue to inform members on the progress of these connections and advocacy made on behalf of our industry. We currently have and will continue to assemble a highly skilled Board for MOD.A with significant expertise and experience in areas relevant to the home modification industry. My own area of interest is the transition of block funded service providers into an open market environment. This is now relevant for both aged care and disability services and I look forward to contributing my thoughts on this subject in future newsletters. The 2016 MOD.A national conference, Modifying the Home: Building | Inclusion | Practice, was attended by over 200 delegates with representatives from NSW, Victoria, Queensland, Tasmania, and South Australia. The Conference kicked off with two very informative and thought-provoking keynote speeches. Our long-time colleague and Board member, Associate Professor Catherine Bridge (pictured), presented findings from the research the Home Modifications Information Clearing House has done over the past three years on DIY home modifications. This has as a primary target the channeling of information to consumers who continue to undertake work which is common to home modifications either themselves or through friends or local contractors. Delegates challenged the wisdom of encouraging people to do this, and whether in fact this would amount to the sector working against its own interests. All very good points and I think that the presentation enabled us over the course of the two days to think about how we need to expand our reach in the marketplace and be dealing much more directly with consumers. I was particularly privileged to spend time with our international guest, Paul Smith (pictured), who is the Director of Foundations in the UK, the national industry body for home improvement agencies. These agencies operate in a very similar manner to our own home modifications providers, and although some of the terminology used in the two countries is different ('adaptations' rather than 'modifications'), the focus on assisting older people and people with disability to remain at home unites the work that we do across the world. Paul's presentation carefully laid out the detail of how the system works in the UK, and whilst there are clearly differences in the way that money flows through the very different governance systems, there are some obvious advantages to the UK model which I picked up on. Most notable is the allocation of funds to local authorities via the Health budget, which, whilst protecting the allocation for housing, enables the targeting of funds to, for example, preventative adaptations, with a view to reducing admissions to hospital. The UK Government, in times of deep austerity, have seen the benefits which home adaptations provide for those who receive them and for the budget bottom line, and have doubled the national contribution for grants to be provided. In addition to the national contribution the local authorities provide funding, such that the overall amount spent on adaptations in the UK nears $1bn per year. This is significantly more than in Australia, even allowing for the larger population, and speaks to a greater awareness of the need to provide decent housing for people with disability and older people to live. Paul was also able to identify where Foundations had done some excellent work with its members showcasing good and innovative practice, and with other colleagues, most notably the UK College of Occupational Therapists, to jointly identify issues and benefits associated with undertaking home adaptations. Paul and I have agreed to keep in touch, share information and look for opportunities to work on common issues into the future. Foundations has an excellent website that this newsletter has featured before and that we encourage readers to visit. A presentation by Karen Pickering, Assistant Secretary, Home Care Branch, Department of Health, on the Next Steps in Aged Care Reform in the Delivery of Home Care Services. MOD.A has regular contact with Karen to inform her of members' experiences with MAC and CHSP and what issues are occurring. 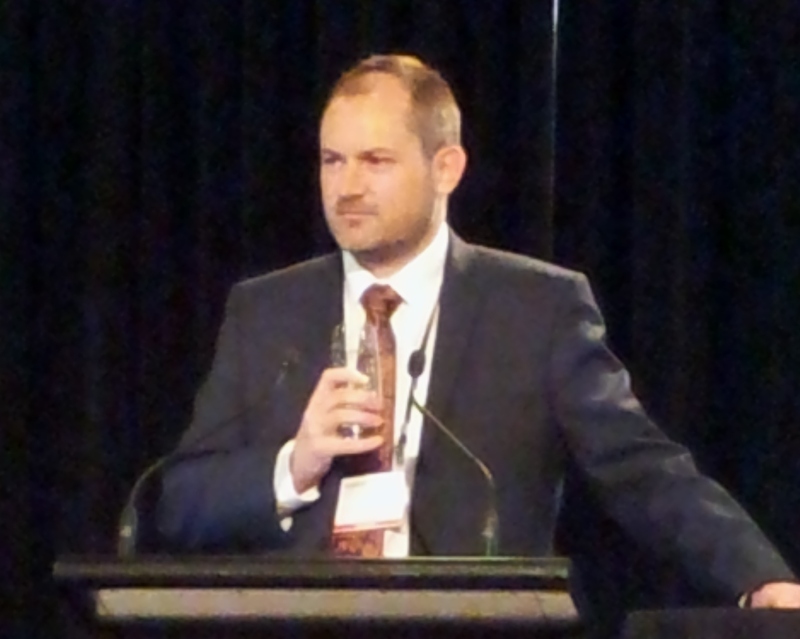 Keynote address from The Hon Shayne Neumann MP, Shadow Minister for Ageing, who spoke about ageing,aged care, the important distinction between the two that is often overlooked and the need and importance of having a suitable home as we grow older. 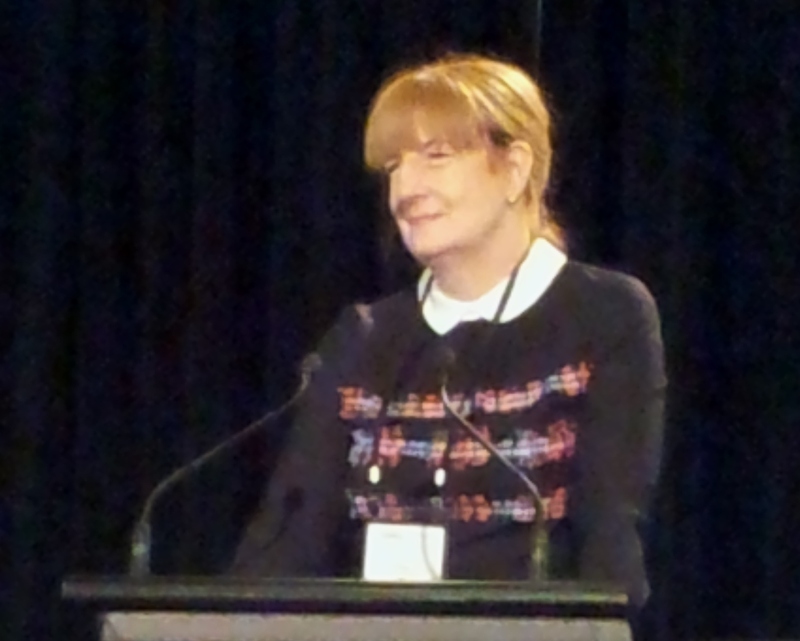 Keynote address from The Hon Kelly Vincent MP, Dignity for Disability MLC South Australia and MOD.A Director, providing a consumer perspective on the importance home modifications have in promoting independence and re-ablement. A discussion on diversity and meeting consumer needs with panel members that included Damian Griffis (First Peoples Disability Network), Dwayne Cranfield (National Ethnic Disability Alliance) and Samantha Edmonds (National LGBTI Health Alliance), who talked about the needs of particular client groups and how policy and those delivering services need to be sensitive to the needs of clients to achieve the best outcomes for them. Overall the conference has been well received, with 91% of respondents satisfied with the quality of conference speakers and 73% with the programme content. This was the first time that MOD.A has hosted a national conference for all in the home modifications sector and bringing a diverse member base of builders, OTs and managers/coordinators to inform on policy and service delivery was a challenge. We will analyse evaluation responses in more depth to inform future events and how we organise and market our next conference. Missed the Conference? All Keynotes and presentations approved for publication are now available from our website. 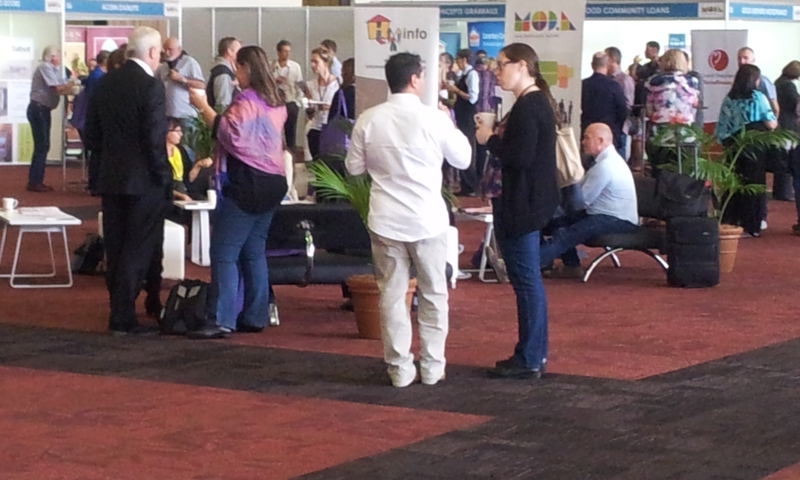 Images: Keynote Speakers Paul Smith; A/Prof Catherine Bridge; Delegates enjoying the trade displays. At the start of May 2016 changes were made to the National Construction Code (NCC) 2016 that affect the construction of ramps. Most notably, ramps now require "acceptable construction practice" for slip resistance. Details were emailed directly to members in a special email Alert but can be accessed via our web-blog post. The changes affect all ramps under construction or completed since 1 May 2016 that were not certified under NCC 2015. We will continue to work with our colleagues at the Home Modifications Clearinghouse (HMInfo) to determine what products and finishes are compliant with the new slip-resistance requirements and advise members accordingly. In the interim, home modification services should contact their suppliers directly to determine compliance of products and finishes they use if this is not already known. Where services are providing their own materials or finishes (eg: rough-broom finishes to concrete ramps) they should test for compliance using a standard P-test (Pendulum-test) and obtain appropriate certification from a qualified testing agent. Advice from the Housing Industry Association (HIA) suggests that services are obliged under due diligence and duty-of-care to ensure ramps comply with the new standards. Where there is any doubt as to the applicability of the new standards or compliance of either product, materials or finishes services should keep appropriate documentary evidence that demonstrates efforts they have made with regards to due diligence and duty-of-care. If you have any questions or concerns regarding these changes please contact us via email. For labourers and fully qualified trades, this equates to an increase of between 46c to 48c per hour (or roughly an additional $17 to $18 per week) depending on the award and trade involved, according to the HIA. The dollar value of the increase for other professions, such as administrative or health workers covered by the SCHCADS or the Health Professionals/Health Services Awards, varies considerably. Services are encourage to review their employment arrangements to ensure that employees are paid no less than the new minimum award rate that will apply from the first full pay period on or after 1 July 2016. At the May meeting of the National Aged Care Alliance (NACA) in Melbourne representatives for aged care from the Coalition, Labor and the Greens provided details of their relative positions on aged care. Commitment of $200 million to dementia research. A focus on quality end of life services and also on special needs groups within the aged care system generally. Urging us to become quite strategic and targeting politicians in marginal seats as the election approaches. Launch of the Age Well Campaign that targets all political parties to end the 'aged care lottery' where people are having to wait for services and to increase funds to meet care needs. The campaign highlights the inequity in access to care and NACA calls on all supporters to sign and promote the campaign petition via Twitter or Facebook. NACA's 2016 Position Statement for the Federal election is now available. We welcome the recognition home modifications and having a well designed home is given in the position statement (Area 14) where reference is made to "a COAG led strategy be developed to implement age-friendly design of housing principles with inclusion of dementia friendly, age-adaptive features, modifications and assistive technology aids. Better designed and renovated housing has a direct impact on the ability of older people to remain in their own homes, either with or without in-home care" (p.24). NACA are one of the members of The Aged Care Sector Committee that were responsible for the Aged Care Roadmap which presents views on the short, medium and long-term actions required to transform the current aged care system into a sustainable, consumer-driven and market-based system. Image: Members of NACA at the May meeting launch the Age Well Campaign. The first reporting period is now for the six-months ending 30 June 2016, not 30 January 2016. Changes to MAC were discussed in a webinar on Monday 23 May. A document summarising the system changes can be found here. Future MAC system releases are due in June and September, reinforcing the Departments commitment to continuous improvement to the initiative. Referrals to service providers should now contain enough information for providers to determine if they can accept a job. Providers should now be able to access attachments (eg: OT reports and recommendations) through the new 'attachments' tab on the client record. Please continue to keep us informed of any issues that you are having with MAC so that we can petition the Department for the necessary improvements. We will be meeting with Karen Pickering, Assistant Secretary of the Home Care Branch, Department of Health, towards the end of June. You can email us with any concerns you may have. The Short Term Restorative Care (STRC) legislation has been finalised and STRC places will progressively become available from 2016-17. The Department will work with key stakeholders to progress the implementation of the programme with consultation on the STRC Programme Manual. The Quality Indicator (QI) Program aims to develop quality indicators to empower consumers to make informed choices about aged care and drive quality among providers of aged care. It is intended that My Aged Care progressively provides more transparent quality information such as quality indicators and performance against quality standards to assist consumers in making their choices. Two Pilots commenced this year in residential and home care to inform the development of consumer experience, quality of life and goal attainment (home care only) quality indicators. Currently, there is limited information about the quality of aged care services available. As aged care moves to a consumer directed model, people will need more information about the quality of aged care services. The Single Quality Framework aims to create one set of standards that support all aged care and minimise any duplication with other legislation obligations, to enable consumers to make informed decisions about the care and services they need. The Department has been working with the NACA Quality Advisory Group to identify information on the quality of aged care services that could be published on My Aged Care. The Council of Australian Governments (COAG) will provide continued support to older people with disability who are not eligible for the NDIS through an existing aged care programme or a new Commonwealth Continuity of Support (CoS) Programme. The CoS Programme will support people aged 65 years and over and Aboriginal and Torres Strait Islander people aged 50 years and over who are receiving state and territory-managed specialist disability services at the time of CoS implementation in regions that are ineligible for the NDIS. Until the NDIS is implemented, clients will continue to access the current state-managed disability system. For further information on the CoS Programme email CommonwealthCoS@health.gov.au. Proposed changes to delegated legislation is open for comment until 9 June 5pm. Information from the webinar on Friday 20 May discussed the new national prioritisation process for home care packages with assignment based on a consumer's individual needs and circumstances. Packages will be portable to enable consumers to move across a wider range of approved providers. The process for providers to become approved providers should be available in the next few months. MOD.A will review these guidelines to determine if they provide opportunities for home modification providers to deliver services to those on a HCP and will continue to advocate that home modifications. and how the home environment can be improved, is considered during the assessment of older people for aged care and are made possible for those on a HCP. The Government is developing an Integrated Plan for Carer Support Services to better support and sustain the work of unpaid carers. Direct submissions on the Plan can be made before 16 June. We know that sometimes carers are approaching services for information about home modifications so this is an opportunity to reiterate the importance of information about home modifications suitable for a carer audience. MOD.A are members of The NSW Ageing Alliance (comprised of over 25 organisations including Aged & Community Services NSW & ACT (ACS), Alzheimer's Australia, Carers NSW Inc, The Aged Care Rights Service (TARS), Council of Social Service of New South Wales (NCOSS), and Health Consumers NSW). The group works to promote the needs, rights and interests of all people in NSW aged 50 years and over, and it is chaired by Ian Day from COTA NSW. Recently the Alliance met to discuss draft position papers on housing policy, income security in retirement, aged care reform, and health and Medicare. The final version of these papers will be available shortly and MOD.A will inform members on how to access them when they become available. We were deeply saddened by the news that Ruth Ley had died on 12 May 2016 at the age of 68. Ruth was a passionate and committed builder in the home modifications sector, working for the service in the Blue Mountains for 20 years. She retired in February this year. A trailblazer in a male-dominated profession, building and championing accessibility in homes was a trade that Ruth came to later in life, having been a conservatorium trained teacher of music, specialising in French Horn. She was a talented musician and cabaret performer and retained her passion for performing music right up until the end, continuing to play viola, the instrument she championed in later life, with the Penrith Symphony Orchestra. Sandi and Michael from MOD.A attended Ruth's funeral at Leura Memorial Gardens on 19 May. Moving tributes were made by present and former partners and close friends, delivered to a packed house which spilled into the gardens outside. People spoke of Ruth's passion for the environment, for her clients, for music and art, and her approach to life - the way she embraced every day. They reflected on her capacity for great community work in music, bushcare, building and community services, and for her activism and advocacy for the most vulnerable people, plants and animals. Whilst a sad occasion the majority of people present were there to celebrate her vibrant rainbow life. Occupational Therapy Australia 2016 Perth Conference: Breaking Down Barriers Through Participation, Pan Pacific Perth, 10-11 June 2016.
International Dementia Conference. Grand Designs: "Are we there yet?" Sydney 16-17 June, 2016. Australian Association of Gerontology: Shaping the future, planning for home in an Ageing World, Sydney 17 June 2016.
International Federation on Ageing 13th Global Conference, Brisbane Convention and Exhibition Centre, 21-23 June 2016. Research to Action Conference: The interface of disability support services and our health system under the NDIS, Sydney, 29 June.